Does it seem a little strange to anyone else that there is a specific day set aside when we should be honest? For the last 50+ years I’ve been under the impression we are supposed to be honest every day of the year. National Honesty Day first came about in the 1990s as a simple concept, be as honest as possible in all your relationships, personal and professional, no matter what is asked of you. Yet it’s often easier said than done. 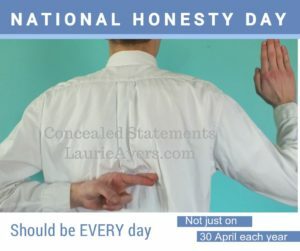 You may ask When Is National Honesty Day? And some calendars will tell you that it is April 30 of each year. However if you ask me, I’ll remind you that it’s every day.